Paper Promises is a shining must-read amongst the vast literature spawned by the recent crisis, painting for us the anthropological evolution of our system of beliefs about the functioning of the economic and financial worlds as it emerged from the socio-historical context of the post-war period. Reviewed by John Gent. 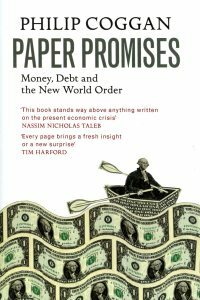 Paper Promises: Money, Debt and the New World Order. Philip Coggan. Allen Lane. December 2011. Philip Coggan’s thesis is that one can view economic history as a never-ending battle between those who have borrowed money and those who have lent it. Historically, on aggregate, borrowers have always won out in the end. However, Coggan explains how this time, because of the global nature and abuse of modern money, the fallout will spare no one. Money embodies a promise that others will accept it as a claim over goods and services to be produced sometime in the future. This gives money two conflicting functions, separated by the element of time. Borrowers argue that money is a ‘means of exchange’ that lubricates the wheels of daily commerce and therefore requires abundance, whereas creditors argue that money is a ‘store of value’ that encourages savings, requiring a degree of scarcity. This struggle is played out over long cycles. Paper Promises takes us on a broad historical sweep of the many attempts to redefine what constitutes money in order to expand its supply, beginning with the first Chinese paper currency in 806 and ending with a detailed look at the present crisis. As each cycle develops we learn to use new monetary tools, expand the supply of ‘money’, begin to believe that we are smarter or better equipped at managing the risks – only to over-reach, suffer new painful crises, and start anew. With each consecutive cycle, the fundamental conflict between money’s two functions is resolved in favor of abundance, to the detriment of creditors. Along the way, money became increasingly reliant on the value of a promise written on a piece of paper – now represented by a pixilated image on your computer screen. Today your money is someone else’s debt and your debt is someone else’s money-like asset. Creditors and debtors are inextricably linked in a mutual embrace based on trust and confidence. These excess promises have been due to three factors. Firstly, the expansion of the welfare-related public sector promises which are neither funded nor properly accounted for, but rely just as much as the debt we do measure on our ability to deliver goods and services in the future. Secondly, private sector companies and households have also been borrowing to an unprecedented extent relative to their annual income flows. Thirdly, following Nixon’s decision in 1971 to abandon the last remaining link to gold which had acted as the anchor to the post-war Bretton Woods regime, the pre-WW1 institutional constraints on the over-issuance of money were progressively diluted, further weakening the mechanisms for achieving symmetrical pressure on nations to adjust to economic imbalances. Coggan argues that when an international monetary system breaks down, the largest creditor still standing designs the rules for its successor: Britain in mid-C19, the USA in mid-C20. The book ends with the prediction that China will therefore design the next. Paper Promises is a depressing tale that needed to be told, which the author does cheerfully and with skill. Coggan, a former investment editor at the Financial Times and now Buttonwood columnist at The Economist, deserves his Best Communicator award: he moves the story along at a fast and flowing pace, combined with the ability to find the short phrase that summarizes in simple language the kernel of many complex economic ideas. Often these are expressed as amusing or acerbic analogies with which the book is peppered. For the academic reader, the book is not the ‘general release’ version of a series of journal papers, such as Reinhart & Rogoff’s This Time Is Different, which Coggan quotes extensively. His book is written from the perspective of the intelligent and well-connected investor/journalist who never lost his desire to keep returning to first principles in order to understand the deeper causal themes. Although he does pay tribute to Hyman Minsky’s evident paternity of the intellectual foundations of his thesis, some scholars will feel neglected by the bibliography. Nevertheless, Coggan demonstrates a comprehensive awareness of the major academic debates in economics and economic history – from the Triffin dilemma to the Dollar Gap, and from the Efficient Market Hypothesis to demographic change – and makes the effort to link these into a coherent narrative supporting his central thesis. The book uses a meta-narrative structure which, although today out of favour in economic history faculties because lacking that element of refutability, when carefully constructed, can be useful in providing historical perspective to the practical policy maker. There are a few minor inconsistencies in the narrative, but the most disappointing lacuna is the small paragraph devoted to the iconic British debate at the turn of C19 between the ‘sound money’ Bullionists – the ultimate winners – and the Banking School’s advocacy for sterling’s role as a means-of-exchange. Britain returned to a fixed gold standard in 1821 in spite of government debt having reached 256% of GDP1. This ‘sound money’ regime lasted nearly 100 years and was eventually adopted by a majority of trading nations. During that time Britain paid a real interest rate on the debt; the maturing debt was repaid or mostly rolled without defaulting and without debasing the currency; and its ratio to GDP brought back to below 30%. A comprehensive analysis of the ‘Debt Supercycle’ hypothesis must surely explain this most important hiatus in the historical abuse of creditors! Paper Promises deserves to be one of the three books you read from the vast literature spawned by the recent crisis (the others being Sorkin’s “Too Big To Fail” and Lewis’s excellent “The Big Short” describing the emotional cost borne by anyone who tries to cry foul once the new ‘game’ is well under way). Coggan’s book completes the must-read trilogy by painting for us the anthropological evolution of our system of beliefs about the functioning of the economic and financial worlds as it emerged from the socio-historical context of the post-war period. The book explains how that belief system has buttressed our confidence in paper money – but is unlikely to do so for much longer. 1 As calculated by the author of this review in a forthcoming LSE Working Paper using S. Broadberry and B. van Leeuwen seminal work on GDP data. Philip Coggan gave a public lecture at the LSE on Thursday 19th January 2012. See more details. This review was first published on the LSE British Politics and Policy blog on 15th January 2012. John Gent is a Cambridge Economics graduate of 1978 with over 30 years experience of working in financial markets in London, Geneva and New York, and is currently a first year PhD researcher in Economic History at the LSE. Before returning to academia, John worked twelve years in private banking at J.P. Morgan, where in 2000 he was chief executive of JP Morgan International Bank when he left to become one of the three founders of Lord North Street Limited, a multi-family private investment office. His research interests are the history of money, debt, the measurement of modern economic progress – and other crowd delusions. Read more reviews by John.